We have a few extra dozen eggs in our CSA store this week. If people with an egg subscription put their share on hold, you will see a dozen pop up for sale in the store. The chickens are happy as ever. We are harvesting a huge amount of dandelion greens fresh from the field for them today. There’s not a better feeling to me than to see those ladies running around, pecking at insects, enjoying fresh farm greens and getting fat on grain! I apologize if the blogs are short and emails aren’t answered in the most timely manner. We are making a big move up to Buellton over the next month and I’m getting in a new groove of juggling tasks. Cindy Dollar is cooking up some delicious granola this week. Coconut Seed is the flavor this week and it’s loaded with healthy pumpkin seeds. Mildly sweet and crunchy, this granola is a perfect addition to your weekly snacks. Grab yourself a bag, the more you buy the more you save. We’ve also added a few more items from Deux Bakery. No better way to keep your dollars in the community than shopping small, local business! And on that note – thanks for being a part of our CSA!!!! It’s truly a labor of love and I look forward to all the new things to come with our big move. 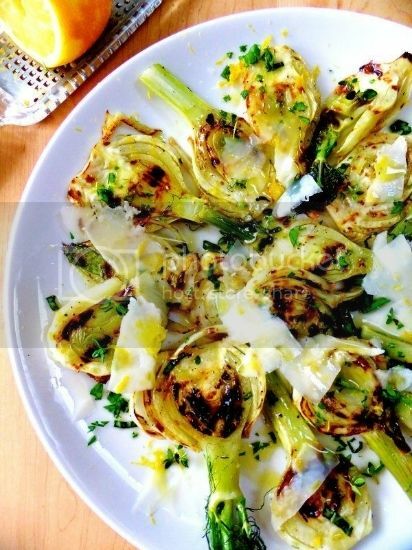 2.On a baking sheet lined with parchment, toss the cauliflower with olive oil, salt & pepper. Spread cauliflower evenly on the baking sheet and roast until golden brown (usually 20-30 minutes). 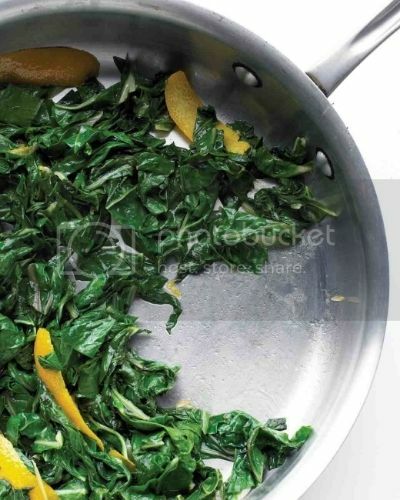 3.Tear your kale into pieces and place it all into a large bowl. Add a generous drizzle of olive oil and a bit of salt and pepper and use your hands to massage the leaves until the kale becomes tender and wilted (the volume in your bowl will reduce by about half). Add a big squeeze of orange, a big squeeze of lemon, a bit of dijon mustard, and use your hands to work it all together. Taste and adjust – if it’s bitter add orange, if it’s bland, add more seasonings. What you add will depend on the bitterness of your kale (I find that I add different amounts each time). If it’s still too raw-tasting, let it sit for 20 or so minutes (at room temp), and the flavors will develop a little more. 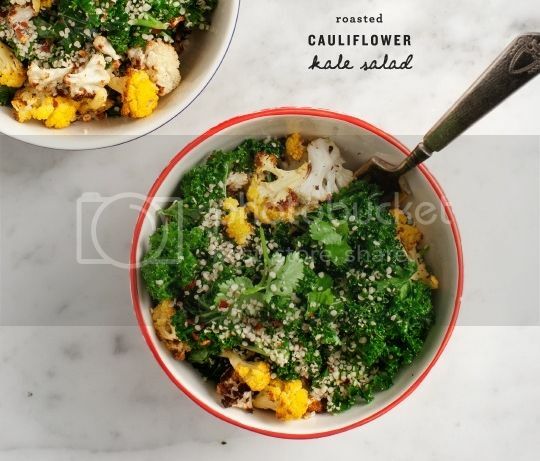 4.Toss in the roasted cauliflower, a sprinkle of hemp seeds and some freshly cracked pepper. If the kale is still too raw-tasting, add some of the suggested add-ons to offset the amount of kale in your salad. 5.Store extra kale salad in an air tight container in the fridge (it’s great for lunch the next day). **If you’re new to kale salad, or if your kale is especially tough or bitter, try mixing in a few handfuls of softer baby salad greens. Combine farro, water and salt in a medium saucepan, bring to a boil, then lower heat and simmer for 30-40 minutes, until farro is tender (about the texture of al dente pasta) and most of the liquid is absorbed. Drain if necessary and set aside. Preheat the oven to 375 degrees. Trim the beets and wash them well, then coat with 2 tablespoons or so of olive or grapeseed oil, sprinkle with salt and pepper and toss to coat. Line a baking dish with aluminum foil, place the beets on it, then cover with more foil. Roast until the beets can easily be pierced with a knife–depending on your oven and size of the beets, this might take a couple of hours. Cool the beets. The above steps can be done ahead of time. 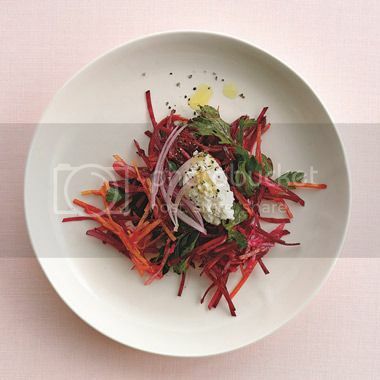 Peel the beets, and coarsely chop about half of one–you’ll need roughly 1/4 cup for the beet vinaigrette. To make vinaigrette, heat a tablespoon of olive oil in a small saucepan over medium heat, add the shallot, and saute gently until soft and translucent, then transfer to a blender. Add the chopped beets, vinegar, mustard, salt and pepper, then blend to puree. With the blender running, gradually add the 1/2 cup of olive oil in a steady stream. Taste and season with more salt and pepper if you’d like. 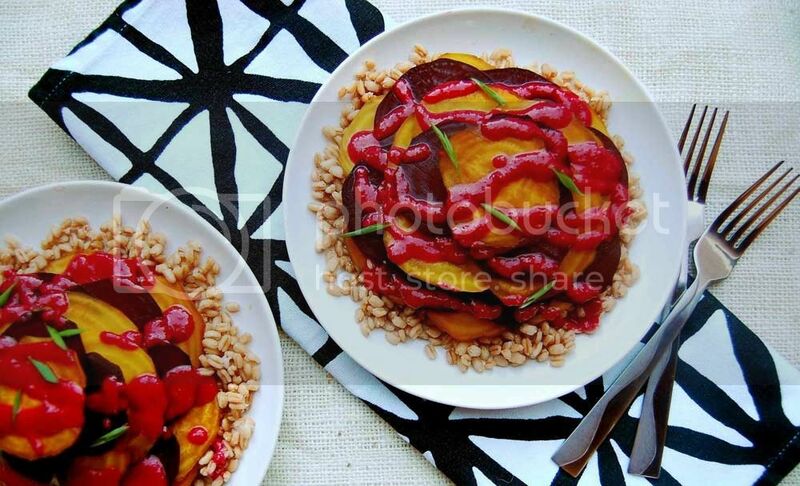 Slice or quarter the rest of the beets, arrange them on plates over cooked farro, and drizzle with the vinaigrette to serve. 1.Preheat oven to 375 degrees F and line round pizza baking sheet with parchment paper. 2.Rinse cauliflower, remove the outer leaves and separate into florets with a paring knife. Place cauliflower florets in a food processor and process until “rice” texture. Some coarse chunks are fine. 3.Place on a prepared baking sheet and bake for 15 mins. 4.Remove cooked cauliflower from the oven and transfer to a bowl lined with a double/triple layered cheesecloth (or a fine kitchen towel). 6.Increase oven temp to 450 degrees F. Transfer cauliflower to a mixing bowl along with egg, cheese, herb seasoning, salt, black pepper and mix to combine. Transfer cauliflower mixture onto the same baking sheet you used to roast the florets (I used the same parchment paper but you can swap it for a new one if it gets too soggy), and flatten with your hands until thin pizza crust forms. 7.Bake for 15 – 20 minutes and remove from the oven. 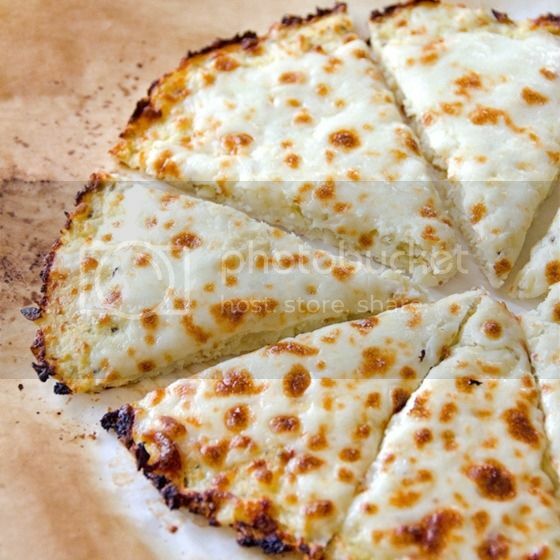 8.Top with your favorite toppings and bake again until cheese on top turns golden brown. Slice and enjoy. Storage Instructions: Refrigerate covered for up to 2 days. You can also freeze the crust tightly wrapped in plastic, for 1 month. This entry was posted in Uncategorized on February 23, 2015 by Carolyn. For anyone who is patiently waiting on the egg list, the time is soon approaching. The hens are enjoying the warmer weather, and ever increasing length of days. We are seeing an increase in egg production and are just waiting for a lot of those eggs to increase in size, as the newer chickens are now laying. We say goodbye to satsumas this week and hello to green cabbage. As we head through the next few months we will experience more variety as new crops start to emerge. Your box is truly full of “farmaceuticals” this week. Dill, an anti inflammatory substance, includes its ability to boost digestive health, as well as provide relief from insomnia, hiccups, diarrhea, dysentery, menstrual disorders, respiratory disorders, and cancer. Cabbage is an excellent source of manganese, calcium, and potassium. It is a very good source of iron, phosphorous, magnesium, fiber, folate, and omega-3 fatty acids. Furthermore, sodium, zinc, and copper are found in good amounts in cabbage. Fennel includes relief from anemia, indigestion, flatulence, constipation, colic, diarrhea, respiratory disorders, menstrual disorders, eye care, etc. And that’s just 3 items in the box. They don’t wear capes or fly faster than the speed of sound, but these veggies are super! Picked fresh for you, they are packed full of health promoting vitamins, minerals and other nutrients for you and your family. Enjoy!! Follow us on Instagram and #somethinggoodorganics with any recipes you create at home. Cindy Dollar is cooking up some Pumpkin Spice Granola this week. It’s made fresh to order in Gluten free or Organic. Get a bag of it here in our CSA store. SO DELICIOUS! This entry was posted in Uncategorized on February 16, 2015 by Carolyn. This winter has been a little sparse for the farm and we haven’t had the variety we are accustomed to due to various lost battles occurring months ago. We are quickly approaching a few new items though and spring is right around the corner. We just planted a bunch of zucchini in our greenhouses to get an early start on the season. We appreciate your support in the way of our CSA boxes and promise to bring you the best of the best of the farm each week. I think we all know the difference between our organic, local vegetables picked within hours of consumption, and the rest of the produce in the store!! My mud boots got a lot of work this weekend while we received about a half inch of rain. It was well received, but creates extra work. A lot of planning goes into the farm when it rains! We lay down cover crops before hand to get the most out of the water, pick crops a day before to avoid deterioration and more. We are winding down on tangerines and might be able to squeeze out one more week, but then they will be gone. I hope you are enjoying them and know they are completely waste free. All boxes that hold those lil cuties are returned to Glen Annie organics to save on resources. Cindy Dollar is cooking up some fresh Cranberry Cashew granola. 100% Organic OR Gluten Free is your choice. Just make sure to specify when checking out of our CSA Store here. We are also in process of adding some new items from Deux Bakery. When you order from the bakery everything is baked fresh, the morning of delivery. This entry was posted in Uncategorized on February 10, 2015 by Carolyn. Cindy Dollar is cooking up some Walnut Spice granola for us right here in Goleta. It’s made fresh to order, and the more you buy, the more you save. Check it out here in our CSA store and we will include it with your share on Wednesday! If you’ve been enjoying the satsumas in your share (hopefully you have!) feel free to also add extra to your share this week. Whisk together juices, oil, and 1/2 teaspoon each of salt and pepper in a large bowl. Trim beets, leaving 1 inch of stems attached, then peel. Using stems as a handle, slice beets paper-thin (less than 1/8 inch thick) with slicer (wear protective gloves to avoid staining hands), then cut slices into very thin matchsticks. Thinly slice onion with slicer. Toss beets, onion, and parsley with dressing and season with salt. Let stand, tossing occasionally, 30 minutes to soften beets and allow flavors to develop. Toss again and season with salt and pepper before serving drizzled with additional oil. *note: If you don’t have white wine vinegar on hand, substitute red wine vinegar or champagne vinegar. Place a baking sheet in the oven. Preheat oven to 475° (keep baking sheet in oven as it preheats). Brush crust with 1 tablespoon olive oil; top pizza evenly with shredded chicken and ricotta cheese. Sprinkle with goat cheese, black pepper, and red pepper. Carefully place pizza on preheated baking sheet; bake at 475° for 10 minutes. Combine white wine vinegar, remaining 1 tablespoon olive oil, and Dijon mustard in a medium bowl, stirring with a whisk. Add arugula and radish slices; toss to coat. 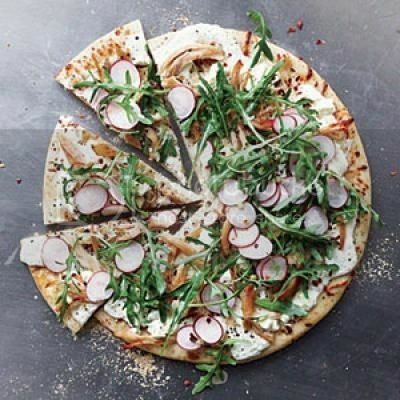 Top pizza with arugula mixture. Cut the pizza into 8 wedges. This entry was posted in Uncategorized on February 2, 2015 by Carolyn.